I made it! It’s been almost 2 months of nothing but Soylent, without breaking down and eating any junk food. It wasn’t easy, but it was totally worth it. But now I am less than 255lbs. l lost 30 pounds in 2 months. I went from tightly wearing a size 42 pant and looking like a walking sausage to wearing a comfortable and loose 38 and looking like I am wearing clothes, not Saran Wrap. I know it isn’t a great way to lose weight, but it is pretty damn effective. Because Soylent is nutrient dense, I didn’t feel sick or lethargic, which makes this much better than the typical crash diet. Not that it was easy: it wasn’t. But the difficulties were almost entirely mental in nature. Due to the reduced calories, my mental processing was much lower. You really do need to fuel your brain, and I spent the last 2 months with my needle close to the empty line. That’s why I didn’t do my weekly posts; I just couldn’t muster the brain space after spending all day working on complex issues. Instead I watched YouTube and played video games. I could have spent that time better, but I don’t regret it. I was working on me, even if it wasn’t in the traditional sense. Craving wasn’t actually the challenge. My punishment was a good deterrent, but mostly I forgot to eat. It was an odd experience for me. I am the type of guy that can always eat. So it was a head trip to feel like I could go days without eating. I swear I was getting to the border of eating disorder. Not quite there, but close. But it was a good lesson, as it did show a potential side of me I should note down for later. The social aspect was hard at first. I’m a loner by nature, but occasionally I poke my head out of my cage. I always thought it would be weird to go out somewhere with friends, and just not eat. I thought my friends would feel odd and the wait staff would be pushy. In reality, no one cares. Once people get their own food no one is bothered by what is on yours, or lack there of. As long as you tip well and act polite the staff is happy to oblige. I had some epiphanies on habit and the nature of craving. I’m not going to go into them here, as I would like to devote a full post to them. But I am glad I did this, and that I was able to follow through to the end. I ate 132 servings over all. That means I will be donating $132 to the Utah Food Bank. I’ll post a quick picture when I do. I will be donating the princely sum of exactly $0 to Ken Ham and his Ark experience. I’ve posted a picture of that donation below. So what’s next? Hopefully I continue the downward slope of weight loss. I am going to try and keep a whole plant vegan diet for health reasons. (The ethics is a whole different post.) My goal would be to get at around 200 pounds. Once I get there I’ll reassess my plans, and maybe come up with some other crazy diet scheme. As for this blog? Tomorrow is the start of NaPoWriMo, so expect to see a poem every day for this whole month. After that, probably some more poetry and political ranting. No matter what, it should be fun. A while back I did a challenge where I ate nothing but Soylent for 3 weeks. It was supposed to be four weeks, but I broke and couldn’t recover. I tracked it in this blog, but didn’t ever finish it out. If you don’t know me in person, then you wouldn’t know I tried the same challenge again for a whole month in August, and only broke 6 times. I lost 25 pounds and felt great. Because of how great ended up buying more of their side product, Coffiest, in the belief I would add it to my daily routine. Four months and two too many shipments (I forgot to cancel my subscription) later, I have way too much of this stuff. Sixty six bottles of Coffiest, 12 bags of powder, and 20 bars. I also have half a box of their new Cacao flavor. That’s a lot of space food to go through. 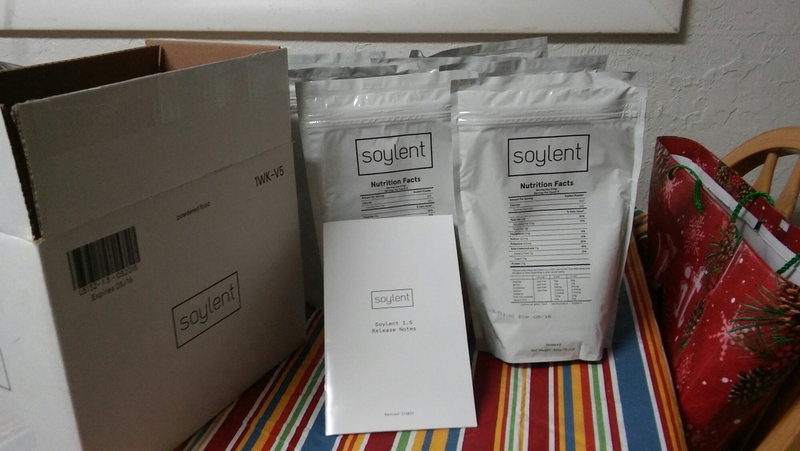 So, in the name of amateur science and self-inflicted suffering, I am going on another Soylent binge. – Any calories I intake have to come from Soylent based sources. – I am allowed to drink water, herbal tea, decaf coffee, and other non-sweetened or non-caffeinated beverages. – I have keep going until I shamefully admit I’m a quitter, or run out of stuff to eat. The rules are similar to my first attempt. But one thing lacking from that attempt was consequences. When I broke, nothing forced me to keep going. For my second attempt in August, I had to donate $5 to a cause I hated. It was a very effective deterrent. So, for every non-Soylent meal I eat, I will be donating $5 to Ken Ham’s organization, Answers in Genesis. But I want to potentially put some good into the world as well. So for every serving I of Soylent I do eat, I will donate a dollar to the Utah Food Bank. I started this morning. My current totals are below. I will be posting a daily count of the above, and will post weekly updates. I may also post poems and other rants as I feel like it, as I know most people follow me for the poetry.